Ironing boards are useful, but one of the major drawbacks with them is where to store them. They are long and awkward and they can also open without warning. That can mean a set of nipped fingers or a crack on the head and neither of those are really a great idea. 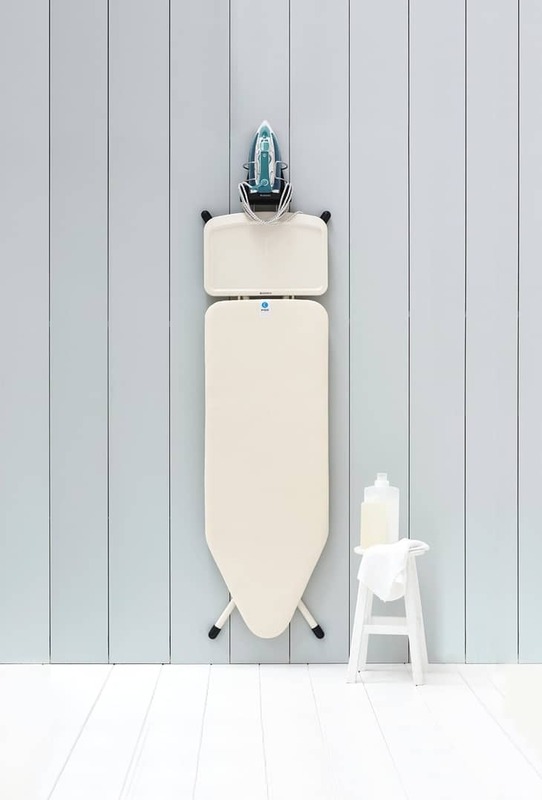 In this article I want to suggest some useful ideas where to store your ironing board and what options are available. There are actually quite a few options but mainly it depends on the size of your home, and where you have some room to keep it. We shall start with the obvious of course and many people will make use of a few different spaces. Ideally the best place to keep your ironing board is in a utility room, if you happen to have one. Likewise if you happen to have some type of indoor cupboard, many homeowners will put in there. Out of sight and out of mind as they say. Almost every ironing board folds up, and usually the legs click into place to stop them from falling out, and causing an injury. Ironing boards are bulky and can be quite heavy. If they get bumped into then they can cause enough damage to you, or to anything that is in the surrounding area. It is always better to have them stored safely, and preferably out of the way. The good news is that there are a few different storage ideas, so hopefully you will be able to find one that suits your purpose. The first type if simply your basic board and they come in slightly different sizes and shapes. The second type for the steam generator irons will always be wider and slightly longer. They can be even harder to store safely. Now if you are also pushed for space, then some type of hanging solution is probably the best idea. I know a few people who store these under the bed as they live in small flats or apartments. That does solve the problem, but it is a pain to get them under the bed, and out from under the bed when you need to use it. That is why many people turn to table top ironing boards. These can be really handy if you are very tight on space. Many homeowners turn to a hanging solution. This is usually in the form of a metal bracket, with a basket that will hold the iron and the ironing accessories, and then there is a separate bracket where the ironing board can be hooked up. You can see an example of a basic iron and ironing board hanger in the image below. These types of ironing board hanger usually cost around £15-20 and they do offer a practical solution to an annoying problem. As you can see the iron goes at the top, and there is a place where you can wind the cord around to help keep that out of the way. The board then hangs just below and keeps both iron and board out of the way, and reduces the amount of space these would normally take up. These brackets simply screw to the wall, so you need to be certain that the wall can support the weight, and that you use the right type of fixings to hold the bracket securely to the wall. A solid wall will hold this weight and to attach the bracket, will mean drilling a few holes in the wall, inserting wall plugs and then attaching the bracket to the wall using screws. With plasterboard or drywall, you will need to use butterfly screws or dry wall screws to make sure you have a secure fit. These are special screws designed to grip the inside of plaster board or drywall cavity style walls. Just below I have listed a few of the most popular choices for home owners for this type of wall bracket. This is the biggest selling option online and it comes with an adjustable hook for hanging up the ironing board. This bracket is very easy to fit. It also comes with a flex reel. It is suitable for all popular steam irons, and is made from heat resistant metal - suitable for a (still) warm iron. It measures 19.3 x 26.2 x 23.2 cm and weighs 431 grams. You can use this one just to hold the iron and the board section simply clips back into place, and out of the way. The distance between the two holes is 105 mm if you plan on fitting it to a door, with a little play room each side. You can hang the iron up when it is still hot. The plate it hooks into is about 1" away from the wall so the heat will not scorch the wall behind. This does need to be fitted high up on the wall, as you need to take into account the full length of your ironing board. Measure this length before attempting to fit the bracket. The disadvantage with this one is that the actual iron will sit really high up on the wall. This is another option to the one above and this one has a handy little basket that holds the iron, and can also be used to hold water jugs or tins of spray. This one is very easy to attach to the wall or door. It comes with a very nice chrome finish that I think looks really well. The rack and storage basket are made of durable steel with a stylish chrome finish. This bracket and storage rack measures 34.4 cm x 18.0 cm x 50.8 cm, and weighs 680 grams. Buyers rate this one very highly with an average 92% buyer satisfaction rating. Some homeowners don't know how to screw brackets etc to the wall, or simply don't want to mark their wall. If that is the case, then an over the door solution is a good choice for you. With this solution you simply hook the holder over a door, and then use the holder to hold your iron and board. The drawback with this solution is that the door will not close, unless you have enough clearance at the top of the door. Sometimes a couple of well placed wall hooks will do the job. This is probably the cheapest solution as you simply attach a couple of hooks to the wall, and hang up your board. The only thing you have to get right here is the distance between the two hooks. As long as the hooks are properly secured to the wall, this is a simple and cheap solution.